The poet Tom Weatherly has died. Known variously as Thomas Weatherly, Thomas Elias Weatherly or just simply Weatherly, Tom was born in Scottsboro, Alabama in 1942 into a prominent African American family of educators and civic leaders. 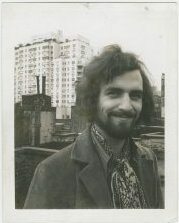 He served in the US Marines, but is best known for his affiliation with the Poetry Project at St. Mark’s Church in the Bowery, an East Village community arts center in New York City. After he arrived in New York in the winter of 1966-1967, Weatherly attended the inaugural poetry workshops at the Poetry Project that were taught by Joel Oppenheimer. Later he worked as a chef at the legendary Lion’s Head pub in Sheridan Square, Greenwich Village. He made many literary and other friends during the years that he worked at the Head (as it was called). Tom Weatherly will also be known for his long tenure at the Strand Bookstore on West 12th Street and Broadway in downtown Manhattan. For many years, he was a fixture working in the basement of the Strand, the gentle giant with the long white beard, looking like a benign character in a fairy tale. His poetry celebrated the black experience in mid-century America, especially the blues, all his poems touched by that influence. Weatherly’s poems were terse, complex, even impenetrable, but always lyrical and full of surprises. His first published book was Maumau American Cantos (1970). He once said his two best books were Short History of the Saxophone and Thumbprint, in that order. He also co-edited the anthology of African-American writings entitled Natural Process (1971), an important anthology that chronicled the black American voice in the late 20th century. Politically Tom Weatherly reflected his conservative roots in Alabama, and only left the Republican Party later in life when he embraced many issues concerning social justice and inequality. Never shy about anything, Weatherly still preferred to stay out of the limelight. He liked to say: “I want my work famous not my face.” Nonetheless, the great photographer Andrei Kertesz photographed Weatherly on the streets of Greenwich Village, and many other less famous photographers also enjoyed photographing him too. Tom Weatherly, his poetry spare and lean, lived just such a blessed and holy life, all of it dedicated to words and other people. He is a poet whose poems will be long remembered and discussed for many years to come. I met Weatherly in 1982 at The Hi Ho Cyclery-165 Ave A in the wild wild Lower Eastside. Weatherly was a poet and a bike bum. He said so with pride. A prodigious rider. A brilliant eccentric.Though his soul maybe in Alabama along with his body his heart and his mind are in New York City.His spirit is loose. No one like the black Jew that I knew. He aged like a fine bourbon. Mellowing but retaining his bite.